I’ve always been drawn to water. I love the oceans, lakes, and ponds. It is as if it is my own little piece of heaven. The place where I can let all my thoughts run wild and yet at the same time I can still feel at peace. I can scream out all my pains without fear. I can cry my deepest cry without judgment. Then, as soon as I have pulled myself together I am literally face to face with myself. Looking at my reflection on the water. Sometimes the body of water may be peaceful, with my reflection gently resting on the surface. Other times the water may be rough, chopping my reflection up. During these times where I would see my reflection over troubled waters it was like another reminder to myself. Reminding me, that no matter how rough life gets I will never be overtaken by its circumstances. No matter how large the waves they will not drag me away from my destiny. The current at times might slow me down, but it will never stop me from reaching my destination. Life has tossed me around like an ocean during a storm trying to drown me in sorrow and depression. Just when I thought I would be lost at sea and soon forgotten about, the waves started to slowly calm down. When I felt weak and thought I could no longer keep my head above the waves a deeper strength from within carried me through. The storm had passed but the choppy waters still remained. I had managed to escape trauma, but the recovery process was just the beginning. Through the waves of life I managed to rise back to the surface after each crashing wave had ferociously crushed over my fragile body. I am a survivor of many forms of abuse. I made it through the darkest of times. I learned to love my reflection even if it was over troubled waters, not just when I look at it on the gently pond. I have learned to embrace myself even when I am being tossed around in the raging sea. My reflection over troubled waters, is a reflection of my strength. A reflection of my perseverance and a reflection of my hope. My reflection over troubled waters is a storm all of her own. Never to be broken. Never to dissipate. I absolutely love this photo that happened to come across my Facebook News-feed on 11/03/2015. Never judge a woman’s strength, everything she has gone through has led up to this very moment and has prepared her for the next. 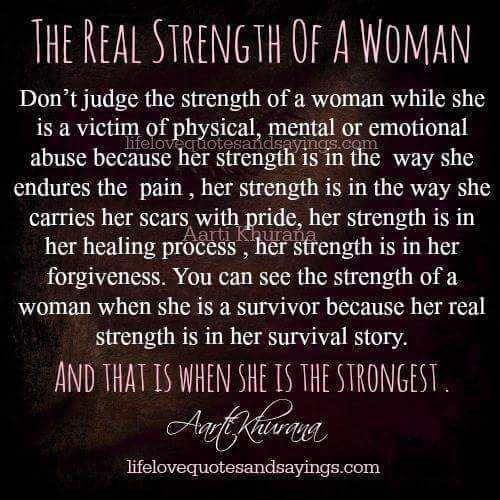 A woman’s true strength really is in her survival story, whatever it may be.You see a woman’s strength isn’t physical. A woman’s strength is mental and emotional. For someone on the outside looking in, they may not see a woman that is in a domestic violence situation as strong. For the most part she is looked at as weak. But tell me this, how is she weak if in despite of all that she endures she still manages to keep it all together in front of you and others? Despite everything she endures she still manages to paint on a smile for public view and for the most part tricking you all into believing that everything is okay? As crazy as that may seem, think of the strength that she has to pour into all of that.It is in that same strength where she finds the courage to leave. To pick up all those broken pieces and day by day piece them all back together. Tell me, if you happen to be trustworthy enough to hear her story that you will still plague her as being weak. When she managed to break free and carry on. When she walks with her head held high and her truly beautiful smile radiates. Don’t ever judge a woman’s strength when she is a victim of abuse. Because it is in her own survival story that her true strength lies. Posted in Blog, Domestic Violence, Encouraging, hope, Inspirational, survivors. Happy Mother’s Day to this beautiful woman my Momma, my super-woman, my Queen!! Without her, I don’t even know where I would be! Thank you for your love, your support, your strength. Thank you for your encouraging words and kicks to my behind when needed. Thank you for always being supportive of all my decisions no matter how hard it may have been for you. Because of you I am the woman I am today, and because of you, I know I will become that much better. There will never be enough words to describe how much love I have for you. Not enough words to describe how grateful I am, not enough words to describe how blessed I am to have you as my mother. All the obstacles you conquered throughout the years, nothing could stop you! Not even cancer could stop you!!! I can only hope and pray that one day I will be as good of a mother as you have been to us! HAPPY MOTHER’S DAY MOMMA!!! I LOVE YOU!!!! This woman is my rock! She is the one I have always looked up to! She is my source of strength when i feel weak. She makes me laugh at times I just want to scream or cry. She lends her ears when I just want/need to vent. Some people say their mothers are their best friend but my mother supersedes that! I’ve gone through hell and back and she never turned her back on me. At times, she would have had every right too, but she didn’t. She has always supported me through EVERYTHING! Good or bad! She lends her advice and says it is up to me to make the decision. Whether I heed to her advice or not, in the end, she is still there. Even if it is me going back to her to say “You were right ma.” She never throws it in my face. I have seen her go through some extremely difficult times. With each one, she got through them with leaps and bounds. I admire her for her strength. She has no idea how much she has inspired me. How much she empowers me. How much she encourages me. I could not be any more thankful to have her as a mother. I am truly blessed. HAPPY MOTHER’S DAY TO ALL YOU MOTHERS OUT THERE!! ENJOY YOUR DAY! Hope. The one thing we think we lose but is never actually lost. It sometimes just lingers in the background. Hope never dies, but simply just fades in the midst of life. Hope is the thing that we held on to for so long in such a traumatic time in our lives. Hope those things would change. Hope those things will get better. Hope that the love that was once there returns back to us. Hope that we survive. And even the hope that we’ll make it out alive. After leaving a domestic violence relationship the feeling of hopelessness sets in. This comes along with the feelings of shame, embarrassment, guilt, unworthiness, self-blame and denial. The hope we once had gets trampled on by all these other emotions. Therefore, finding it hard to get a grasp on it. Overwhelming emotions wash over us when we first get out. Like any traumatic event, you don’t really see what happened until you have stepped out of it. That is why when a survivor is free from their abuser they experience the shock factor or the aftershock of the events that took place. While in the relationship the victim doesn’t quite see what is going on. What do I mean? His or her brain is so distorted from the emotional and verbal abuse. They actually believe all the things that were said of them by their abuser. The victim has low or maybe even no self-esteem. From being told that they are nothing or will never amount to anything so many times they start to believe it. When told that no one will love them they end up believing that as well. The injuries of physical abuse heal, but it is the invisible wounds of the emotional and verbal abuse that still remain for long periods of time. With the proper help, these wounds too will heal. So how do you get your hope back? How do you bring hope back to the forefront? You do it by first acknowledging what you have gone through. Remind yourself that none of it was your fault. Remind yourself that you never deserved any of the abuse. Look in the mirror each day and tell yourself that you are worthy, you are beautiful/handsome, that you deserve the best and nothing less. In my previous blog “Trust Afterwards” I mentioned setting goals and achieving them. Set realistic goals. Start with one area of your life and set an achievable goal. Maybe something like getting a job, or going to the gym, taking up a class of one of your favorite hobbies (art, music, sewing, fitness classes, etc.) Also, when you achieve a goal reward yourself. This will instill hope and will also empower you. The greatest example you can give yourself is remembering that you did make it out. Remembering that you successfully followed through with your plan. You were in a horrific experience and you survived. Through surviving that, you can and will survive anything that comes your way. That alone deserves some celebrating. There is hope. There always will be hope. Hope never leaves us, it never abandons us. We just have to sometimes dig a little deeper within ourselves to grab hold of it. Once we do, we once again become an unstoppable force. We once again realize that we can do anything we put our minds to and set our hearts on. We once again see our worth. We once again see the beautiful person that we have always been. Thank you joicelizsabeth (my soul-sister); for nominating me for the Sisterhood of the World blogger award. To say I am honored is an understatement! I thank you so much, and truly appreciate you J! It looks like all I have to do is answer 10 questions, and nominate other women who are more than worthy of a nomination. So here are the questions posed to me. – At first, I wrote a blog to share my experience of domestic violence. In all honesty, I thought that would have been my one and only blog. The only thing I had asked for was that it helped just ONE person. Now, I blog to help give hope, to empower, to uplift and to build up other survivors. I blog, because I now know, that I am a voice for those who have not yet found their own voice. Do you hope to accomplish something with blogging or do you just enjoy it? – I feel as though I have accomplished what I set out for, I see that I have touched and helped many which is why now I just enjoy writing blogs. I enjoy hearing from readers who share parts of their own stories. I enjoy hearing from readers who say that a recent blog I posted gave them hope. So, I guess I just enjoy it. What are a few of your top books? How about movies? What are your favorites? – Hmmm.. I love horror movies. I am so bad when it comes to remembering movie titles. – I could not live without my laptop or cellphone (sad I know), but it is how I communicate with my other bloggers/sisters across the world. How would you hope to be described? – I would hope to be described as; Loving, kind, caring, giving, thoughtful, inspiring, encouraging, and empowering. What is your soapbox? That one issue that always puts you right up there? – Domestic Violence and Child Abuse. What do you do for work/day job/ etc? – Currently; I work in an emergency department. To those I chose as nominee’s, you do not have to take part in this if you do not want to. However, I would ask that you pass this on and nominate a blogger whom you think deserves it. There is a moment that comes for a victim when they just know. They know that it is now or never. They know that this is more than likely the only opportunity they may ever have to escape. There is no time limit. The number of years it took for the victim to leave does not compare to the fact that he or she survived! Because, as a survivor I can tell you, all you want is for the person you originally met to return. You didn’t fall in love with the monster, you fell in love with its disguise. You fell in love with all that charm that was poured on you, the wooing effect. You deny the fact of knowing that the facade you met will never return. During the whole relationship, you try and change yourself, to keep your partner happy. But they are never satisfied. You change, when it isn’t you that needed the change. The abuser, who is so insecure with themselves cannot admit to it, so they put it all on you. It is a way to stroke his or her ego and insecurities. I wrote several blogs before, about this moment. How something inside of you awakens(I refer to it as a tiger in one blog). All of your senses come back to you. Life returns back to the lifeless body. All the control and power you gave to your abuser seems to get sucked out of them and returns to you. You just know that NOW is the time to go. For some, it may have been a few years, others ten or more. However, the important thing is that you made it! YOU SURVIVED! You followed your gut instinct, you knew it was at that time that you had to go. You “woke up” from your nightmare. However you planned your escape, whether contacting family, friends or an organization. It was successful. Let me say I am proud of you for making it this far. This is the moment that you have been waiting for. The moment where you get YOU back. The moment where you get your LIFE back. This is the moment of NEW BEGINNINGS! This moment is the moment of the rest of your life! This is the moment where you will no longer be a victim, but you will become a survivor! It was a tough journey, an unexpected one that you never thought you would experience. But do not beat yourself up over it. Always remind yourself that none of it was your fault! You NEVER deserved ANY of it! When you are ready, share your story, use you experience for the good. Help others. Take it from me, this is the best decision I made; sharing my story and experiences, blogging to encourage and empower other survivors is the greatest thing I can ever do. I have found so much happiness in the connections that I have made and continue making. There is nothing better than knowing that you are NOT alone. TRUST ME; YOU ARE NOT ALONE!!!! To those who may currently be in an abusive relationship, you also are not alone. If you would like to reach out (which I hope you do) please go on my “Contact Me’ page, and you can contact me through the outlets there. By whichever form you feel safest. I will always answer and reply as soon as I can, which is typically that same day. You do not have to worry, I am the ONLY person who checks the email, DM’s and private messages and they are all linked to my phone. I urge you to listen to your instinct, it will never steer you wrong. There are tons of outlets that you can turn to as well (many are mentioned throughout my other blogs). Also, your family will be there for you with open arms, I know one of the things an abuser says is that no one loves you like him or her. But they are so wrong! For one family NEVER stops loving you. Secondly, he or she doesn’t love you, because if he or she did love you, they would NEVER do these things to you. One thing I ask that you always remember; is that you are not to blame! You are not doing anything wrong that allows any of this to happen to you.